Following the 100th anniversary of the Bohinj Railway, with Slovenian and hopefully Italian special trains – with ex-JZ “25” Class 2-8-0 (below) and the latter with Borsig “06” 2-8-2 (pictured just inside Austria in 1971) l the next day with the “06” or “25” (or the FS version, the “728”) and a visit to the Ljubljana railway museum; Bosnia for working “Kriegloks” and n.g. 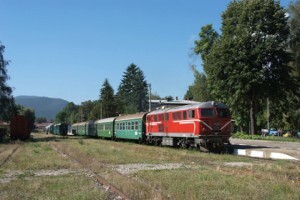 “83” 0-8-2’s in industrial sites, and Serbia for the spectacular Mokra Gora n.g. system also with”83″, other industrial locations with USA tanks, 900mm Davenport 0-8-0’s, Skodas and many more; a main line steam special on one of the scenic secondary lines, with the Serbian “01” 2-6-2 (below). As soon as the itinerary and price are established, you will be able to click on links for latest itinerary and a booking form, which will include a variety of travel options for getting there and back.